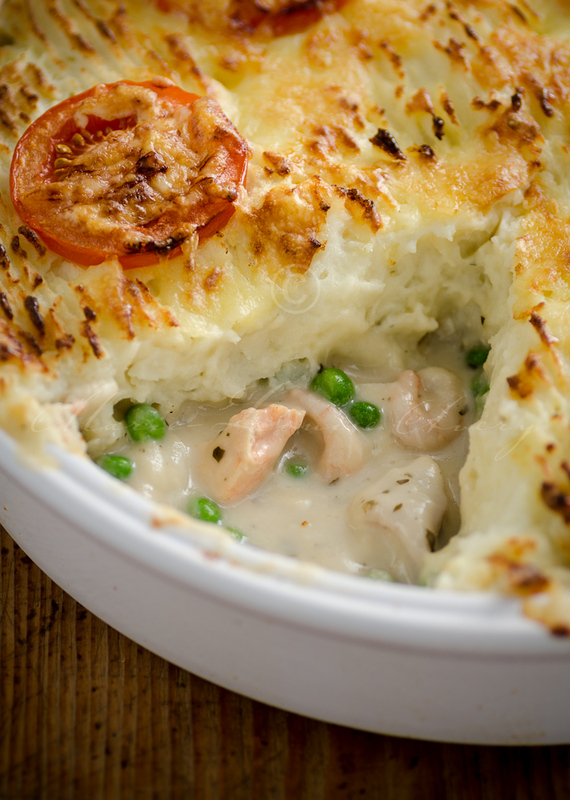 Everyone loves fish pie – the ultimate comfort food. I shot this last month as part of a job for a large pub chain, commissioned by JWT, so although I can’t give you this exact recipe, I can tell you it was jolly good! Here however is the recipe for my own fish pie so you can create your own comfort moment! Boil the potatoes until soft. Drain, and mash until smooth, adding the parmesan and season to taste, cover and leave to one side. Poach the fish in a large wide pan with the bay leaf, mace blades, peppercorns and enough milk to cover and poach the fish for 5 mins, until the flesh becomes opaque, and flakes easily. Remove the fish from the pan, preserving the poaching liquid, and when cool enough to handle, remove any skin, and bones and break the fish up into nice sized chunks and put in the bottom of a baking dish. Melt the butter stir in the flour and whisk in the strained warm milk the fish has poached in adjusting the volume to 200ml with more milk if necessary. Combine until you have a smooth thickened white sauce. Add the peas to the sauce, stir in the creme fraiche, season to taste. Pour the sauce over the fish, and carefully spooned the mashed potato over it all. Sprinkle extra grated cheese on top if you like it and then bake in the oven for 25-30 mins, until the top is golden brown and crispy. Next Post The perfect strawberry?